← “Occupy Worcester”- Maybe I just don’t get it? Disclaimer: I take full responsibility for my inaptitude in this entire situation. In no way is any other party responsible or accountable. CarFreeBrad bares sole responsibility for his actions! That said, I think it’s clear I’m able to take responsibility for my actions and place no blame on anyone except myself. It’s irony of the entire thing that makes me SO MAD! Last night I went to the WPI Venture Forum focuses on Life Science Innovation, which was great. Great speakers, great people, good food. I was running late getting off the train from Boston so I had to buzz from Union Station over to WPI. Admittedly, I was in a rush and tired as I had been up since 4am and at the office since 7. I cruised into campus in a rather good mood, locked up the bike right in the heart of campus just outside the student center in between the gym and what appears to be 3(24 hour) labs. As I said, the event was good and around 845 I was fading fast and needed to get home. I was actually looking forward to a nice ride home, downhill most of the way thru a few neighborhoods I never get to ride through but that good relaxed feeling was ruined when I returned to my bike to find that my front light and jacket had been stolen. Again, I simply forgot to take my light off, put it in my bag, unclip my bike bag and bring it with me so really I blame myself. The part that makes me SO mad is the fact that I have spent the last 7 months locking my bike up on Main street, at Union Station, the bus station, south station, random/sketchy parts of Boston and Worcester and many other times I’ve forgotten to lock my light, bag, helmet. Sometimes I have remembered and run back. Others I was already too far gone and just hoped for the best and luckily everything was still there even after a FEW DAYS! The irony is that I locked my bike up in the HEART of WPI’s campus and even if I had realized my mistake I was only going to be away from my bike for about 2 hours and would have felt pretty confident(compared to the above mentioned situation) that it would be ok.
Just as warning to the person/people who stole the 2002 Boston Marathon windbreaker; its bright YELLOW and I know each one of the distinguishing markings that you can’t hide. So PLEASE, where it around town…..cause I’m coming for you! PS- to anyone that happens to own and wear a 2002 Yellow Boston Marathon windbreaker, I apologize in advance for you incurring my wrath. I’m sure I will recognize that it’s not mine early before the situation goes really bad. This entry was posted in Bike commute, Car Free, Urban Bike and tagged bike theft, Boston, Boston Marathon, CarFreeBrad, revenge, South Station, Theft, Union Station, Worcester, Worcester Polytechnic Institute. Bookmark the permalink. 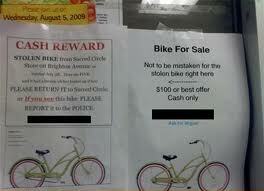 1 Response to The Most Ironic Bike Theft EVER!!! Bancroft Tower is pretty cool. It’s off of Salisbury Street. I woldun’t say it’s worth a trip to Worcester just to see it, but if you’re in the area visiting family, then it’s worth checking out. You can’t climb up it like the people in the picture.